" Born 1995 in Riverside Ca, Jake Haldenwang, is a naturally gifted guitarist, singer/song writer "
Born 1995 in Riverside Ca, Jake Haldenwang, is a naturally gifted guitarist, singer/song writer, who developed a deep passion for music through his father’s extensive CD & DVD collection of everything from original roots blues, soul, R&B, folk, modern & good ole’ vintage rock & roll. Shortly after moving to Charlotte, NC, at age 11, he was profoundly drawn to the powerful guitar sounds of Hendrix, Clapton, Jimmy Page, Duane Allman, AC/DC, SRV, Slash, Jeff Beck, John Mayer, Billy Gibbons, Rory Gallagher and Albert Collins. He then began teaching himself to play on an acoustic guitar, while saving his money to buy his first electric, a Fender Stratocaster at age 12. Obsessively focused on honing his skills, playing daily for hours on end, while also attending music jams at local area pubs, he quickly developed a natural feel, with the passion and abilities of a seasoned player well beyond his years. 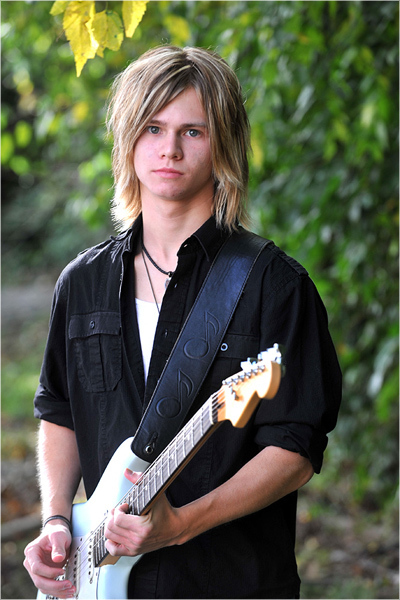 Being locally recognized at age 13, Jake was chosen to represent Charlotte NC at the 2009 International Blues Challenge in the IBC Youth Showcase. Upon his return, he organized and fronted two different bands, “Jake Haldenwang Band”, a four piece ensemble, and his power trio “Halden Vang”. Both of which have played hundred’s of shows at many notable clubs, theatres and festivals through-out the South Eastern States and have had the fortune to have shared show billing with several music greats, to include; Warren Haynes, Greg Allman, Buddy Guy, Steve Miller, Leon Russell, Elvin Bishop, Jimmie Vaughan, Kevn Kinney/Drivin N’ Cryin, Trombone Shorty, Moreland & Arbuckle, The Holmes Brothers and Tommy Castro. Jake has also played as a guest guitarist with Buddy Guy, Marshall Tucker, Chris Hicks, Walter Trout, Umphreys McGee and Bryan Lee. Jake’s stock in trade is his undeniable stage presence and unique musicianship. His live shows are described as intense, soulful and fiery with a style and flair that pushes the boundaries of music. Being influenced by a diverse music landscape, Jake’s musical palette is inspired by and extends across many genres as he continues to cultivate a signature sound in his playing, singing and original song writing approach. His music sensibilities and wide array of influences include; Fleetwood Mac, The Beatles, Foo Fighters/Dave Grohl, Black Keys, Black Crowes, Humble Pie, Little Big Town, Needtobreathe, Rival Sons, Paramore/Haley Williams, Cage the Elephant, Stevie Wonder, Alicia Keys, Otis Redding, Springsteen, Jack White, Chris Cornell, Myles Kennedy, Jeff Buckley, Steve Marriott and Bob Dylan. In addition to being a guitarist, singer/song writer, Jake is a multi instrumentalist, playing both the bass guitar and drums. He is also an accomplished acoustic musician who performs as a solo artist, as well as, fronting his own band. 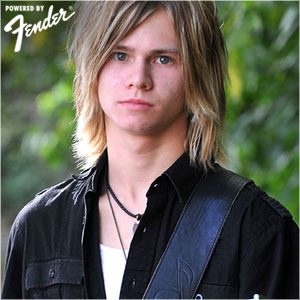 At age 16, Jake was nominated & awarded “Artist of the Year” by the Queen City Music Awards and his band “Halden Vang” was also nominated for 2011 “Band of the Year” by the Charlotte Music Awards. As a song writer, Jake wrote his first song, “Tell the Truth”, at age 14 and released his first studio Cd, at age 15. Jake has since written and composed hundred’s of original songs, eight of which he recently recorded in the studio that are slated for his next upcoming CD, which is planned to be released this summer and followed by extensive touring upon his graduation from high school June 2013.